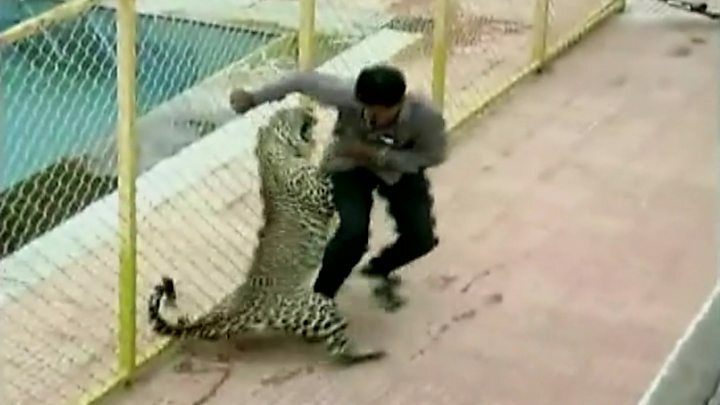 A male leopard which entered a school in the Indian city of Bangalore injured six people trying to capture it. A scientist and a forestry employee were among those mauled during the near 10-hour long effort to corner the dangerous animal on Sunday. The leopard, which strolled into the Vibgyor International school, was eventually tranquillised and released. The eight-year-old male was spotted strolling inside the school premises in the Kundalahalli area. Footage on the school's security cameras showed it attacking a man near a swimming pool. Conservation scientist Sanjay Gubbi and forest department employee Benny Maurius were injured when they tried to corner the animal and tranquillise him, reports say. "It was a long struggle to capture the leopard. Although it was injected with tranquillisers it could be captured only around 20.15 local time when the medication took full effect," senior police official S Boralingaiah told reporters. Wildlife official Ravi Ralph told the BBC Hindi's Imran Qureshi that the leopard possibly strayed into the school from a patch of forest not far from the school. Last year a male leopard spent five hours with its head stuck in a metal pot in a village in the northern state of Rajasthan.